I had written an article about the Note 5 and the iPhone 6s Plus and I take this time to write about one of my favourite and one of the best smartphones out there, the Samsung galaxy Note 7. 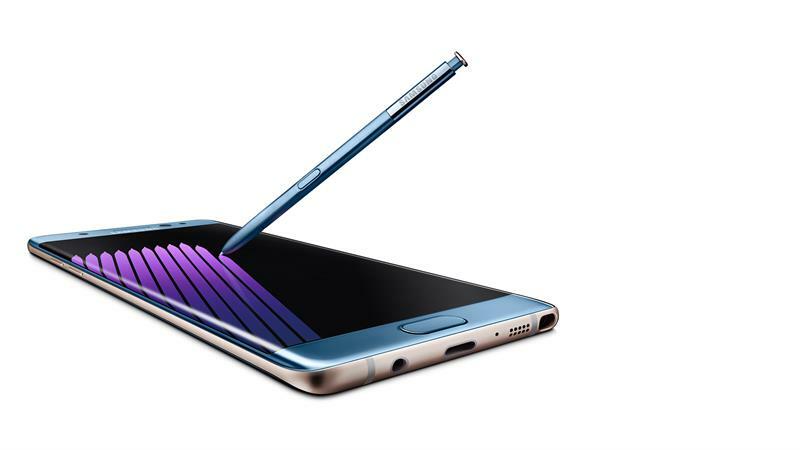 Samsung skipped the 6 and came up with the Note 7. Now there have been a lot misconceptions and also a lot of doubt in the minds of the people as to what prompted Samsung to do this. There is nothing so mythical about it, the only reason why Samsung did this was to make the numbering of the S models and the Note models similar. The Note Series was lagging behind in the numbering and releasing a Note 6 would have meant that the new Note is inferior to the S models. Now that the numbering issue is solved and the Note 7 is released to the consumers the world around, there has been a lot hype, gossips and a lot of hue and cry over the device. We have even heard news of Samsung recalling all its sold Note 7s because of the faulty battery and the overheating issue. Now I am not going to comment on any of that but would like to inform my readers that there have been instances where the phone had some issues and have been discussed around, but now almost 99% of the smartphones are good and there is no problem whatsoever. But identifying the faulty one is something we can't do. So I would suggest my readers if you are a Note fan then wait for the confirmation from Samsung as far as the resolving of the bug is concerned. To be precise only 35 phones have had the issue among the 2million smartphones which hit the market. Now goodness me! Who is going to buy a phone costing around 60ks and risk their property and life? There is a video on YouTube where a man claims that his beloved jeep got exploded only because of the faulty Note 5 bursting into flames while charging inside the Jeep. He even adds that even though he switched to Android and the Note Series from the iPhones, is pledging to never use any Samsung product in the future. That is a big concern, even though one man skipping to use Samsung devices doesn't do any harm to the company but to a great extent the reliability and the credibility has been hampered and Samsung needs to do something as early as possible. Now that the iPhone 7 has been released it is going to be a hard time for the Korean Smartphone giant. Now let's move to the device. I can simply say without any hiccup that this is the most beautiful device on the planet. The curved screen, the symmetrical design, the all glass and metal body, super fabulous screen, mind boggling build quality and the most carefully crafted buttons makes this undoubtedly the best in the world. You may argue with me about this but I am adamant to say the least. This time around Samsung has brought the idea of going for a curved display on both the sides and I would say it looks stunning. If any of you around have never used a Note before and is planning to upgrade to one, one thing which you may have in your mind is the size of the smartphone. Is it too big for my average sized hands? I would say a 5.5 inches screen is big and in no way you are going to be comfortable using it with one hand, but one thing because of which I truly love all the Note devices is the basil size. This time around Samsung has made this phone so narrow with a very thin negligible or even a non-existent basil, that when actually the device feels not so cumbersome like other big-sized smartphones. So design wise this is truly charming and one of the best. The Samsung Galaxy Note 7 has a 5.7 inch Super AMOLED Quad HD display generating a PPI of 518 pixels. The specs speak volumes about the display. It is truly a fantastic display and is one of the best. The punchy colours of the AMOLED display are truly fantastic and have a lot of positives to it. I am pretty sure people know how a Samsung flagship device's screen fares and I am not going to say a lot about it. Literally it is superb display but may not be liked by everyone because of the extra punchy colours, but those who like AMOLED displays they are going to love this Note 7's display even more. The TouchWiz runs on the Android Marshmallow with a planned upgrade to the v7.0 Nougat. The visual presentation of the Samsung's TouchWiz which is running on top of Android Marshmallow looks good and premium too. Samsung has tried a lot to make this look a bit more premium than the cartoony TouchWiz designs we had in the initial stages. So if you are a TouchWiz fan you may like the new look of it. The Note 7 is powered by two Exynos 8890 Octa Core chipsets, the Mongoose and the Cortex-A53 clocking at 4X2.3 GHz and 4X1.6 GHz respectively. The device has a Mali-T880 MP12 GPU with assisted by 4GB of RAM. All this culminates into a very much performing device with much efficient power usage. This is a very good performer by today's flagship standards but there is a little bit of lag here and there while switching between apps. I have mentioned this in my review of the Note 5 as well. This is an area where Samsung needs to work on. The RAM management is not that great like the Nexus 6P or the iPhone 6s plus if you ever were to compare. Overall using this smartphone as your daily driver is quite great. Now speaking about the Finger print scanner and the Iris Scanner I would say both works well. But the Iris scanner will take a little bit of more precision to work the way it is meant to be. I don't think people are going to use it anyway when you a Finger print scanner at your disposal. The FP Scanner too is fast and performs well. Now a huge addition is that though you can use the phone in water, the S-pen too is sealed up to be water-resistant and that is good. Note users seldom use the S-Pen, so using it under water doesn't make sense, but we like the fact that it is there. The Iris scanner though is the first of its kind in a smartphone, works well. It recognizes your iris pretty quickly and is a good addition, but I think most people won't use it, why would you if you have a reliable fingerprint scanner for unlocking your device. The Note 7 is equipped with a 3500MAH battery and will give a normal day of usage. Normal users can extract more than 1 day of normal usage with all those power saving modes. The storage is where Samsung has done something really amazing. There is one variant, the 64GB one and that's it. This is of course a good move. Nowadays in the age of 4K videos and high quality photos there has to be good amount of storage on our devices and I think 64GB would be more than sufficient for most users and if you aren't content with it you can expand your Note 7 up to a whooping 256GB of storage using an SD card and be ready always for any moment of adventure. Samsung Galaxy Note 7 is studded with a 12MP rear camera and a 5MP front camera. The camera is capable of shooting 4K video. Even though I have a lot to write, I am choosing to sum this up. The camera is excellent and one of the best. One thing I truly love is the fact that this the same camera you find on the S7 and S7 Edge which was a very beautiful camera experience. Now one thing I have noticed is that the camera tends to overexpose a lot which gives it a bit "low on detail" effect. Even though it can be managed by using HDR for both in artificial as well as natural lighting conditions other than that I don't think there is an issue. Arguably it is one of the best cameras ever incorporated into a smartphone. The Samsung Galaxy Note 7 is priced at around Rs.59,900/- at all the leading stores in India. This is truly a very premium price point and I would say value for money. Every single penny you spend is worth it. The only thing I have against this is, if at all there is a 6GB RAM Note 7 it should be available for every country, and I think no compromise can be entertained at this price point. Beautiful design, excellent build quality, superb display, good battery life, good performance, amazing camera. Glossy glass back prone to scratches, disappointing RAM management. There is not a lot to say. The phone is excellent and is very good value for money. The only thing I would suggest my readers is wait until Samsung fixes the issue of faulty batteries bursting into flames. Then you can go for it. No one will buy a 60k phone that burst into flames while charging, so please Samsung fix the issue.